Logan and Alex did a terrific job installing the gutters and downspouts on my home. Answered all my questions. I would highly recommend them to anyone who would like or need to have Advantage seamless gutters put on their home. Excellent service, quick install and they look awesome! Very Happy! Fast reliable service. They came out, did a quote and the work all within a few days. The crew was knowledgeable and very efficient in the quality of work they did installing gutters on our home. I was very happy with the work they did and would highly recommend them to others. Colors matched the house perfectly! Both installers were very nice and did a great job!! Everyone from Vince the salesman to Diane, Mark and Savannah in the office to the two installers today were all polite, professional, friendly and down right awesome! Thank you! Proud to tell others about your company! Workers were friendly, arrived as scheduled, and did great work!! Both guys did an excellent job and were very professional. Our house looks great! Very quick and professional!! My gutters look great which makes my house look even better! Thanks to Cory and his outstanding team @ Advantage seamless gutters!! Professional crew did a great job! Had a quote returned to me within a hour of meeting sales rep. Fair and reasonable with great service. Looks great! Nice installation and clean up job! 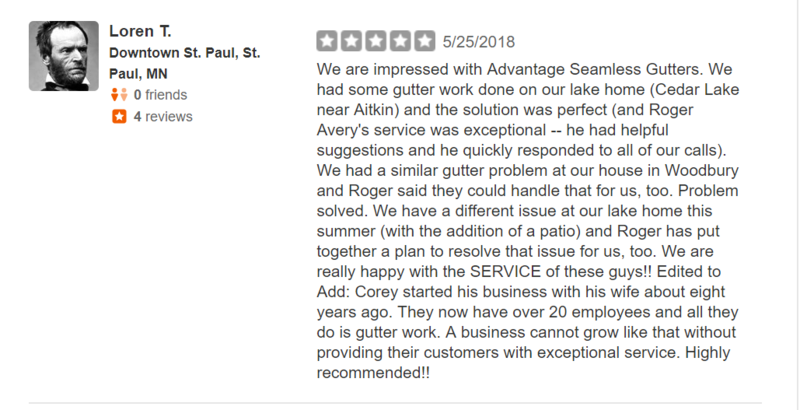 A “Filtered Review” is a legitimate review from an actual Advantage Seamless Gutters customer who posted their review on a review website such as Yelp. But Yelp does not display all reviews and are subsequently “filtered” out of view on the Yelp website. You can see our filtered reviews below. Read the reviews below and you will see more very happy Advantage Seamless Gutter customers. Advantage Seamless Gutters is an outstanding company with an exceptional product. Our 100 year old home was in desperate need of a renovation. The pitch of our roof is uniquely steep and contains different levels of windows and eaves. Advantage seamless came to our home and immediately recognized the deficiencies in our existing gutters. Not only did our home have gutters that were too small to handle the pitch of our roof, but the downspouts were located too close to the foundation of our home therefore creating water problems in our basement. The consultant for Advantage was very honest and knowledgeable about the solution for our home’s gutter needs. The vast variety of their products made it simple for us to choose a style and color to fit our newly renovated Tudor home within our budget. The cost was exactly as estimated by our Advantage consultant. The product was installed during the cold, January MN month by Advantage Seamless’s crew of hard working employees. Our gutters are not only functional but beautiful. We couldn’t be more pleased with the whole process Advantage Seamless Gutters provided. Great work. Our house and garage look awesome. Thank you!! We would recommend them to anyone!!! Advantage Seamless Gutters installed our gutters last week. They sure look nice! These guys do fast and efficient work! In and out in a flash and no mess left behind! Thanks!!! Advantage Seamless installed our gutters Monday. Crew was very personal and professional. Would highly recommend Advantage Seamless for your gutter needs.